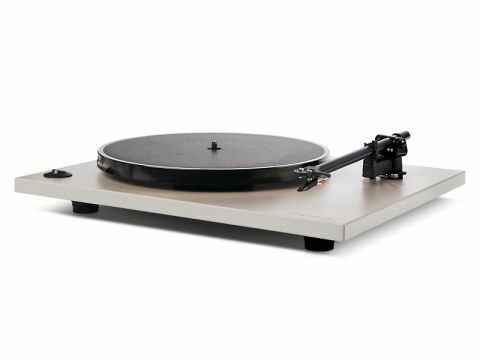 Rega, once the king of the affordable turntable sector has just reasserted its position in the market a brand-new entry-level model, the RP1. This new turntable replaces the rather dowdy P1 and sports not only a new platter material, but a totally new tonearm to boot, an arm we are told that hints at changes to come across the entire range. The platter is now moulded in phenolic resin which was once known as Bakelite; one of the first plastics to be used in manufacturing and usually associated with radios from the forties and fifties. Rega chose it not for its aesthetics, but because it's one of the hardest and stiffest of all plastic materials. It can also be precisely moulded and remains stable over long periods. The RB101 tonearm replaces the RB100 of the P1 but looks very similar. It is, however, significantly lighter according to Rega, which, all things being equal, suggests a more stable platform for the cartridge. Its one-piece construction, from headshell to counterweight stub, should also ensure minimal resonance, too. It comes with an Ortofon OM5e moving magnet cartridge already fitted and aligned, so that all you have to do to get the player up and running is push the counterweight as close to the bearing as it will go and set anti-skate. Which is about as straightforward as set up gets. The plinth of the RP1 is painted MDF and is available in three colours: black, silver and white. It supports the arm and main bearing which has a sub-platter that takes the belt drive and the motor. The latter is not decoupled in any way from the plinth, which means it has to run very smoothly if vibration is to be kept at bay. The deckle sits on three fixed rubber feet and a good-quality clear lid is supplied to keep dust out. Although you are encouraged to close it during use, we found that the sound improved with it fully removed. While the fingerlift isn't quite as curvy on the RB101 as the classic RB300/301, it's almost as nice to use and makes for easy cueing with or without the arm-lift. Once the OM5e is settled in the groove you can hear Rega's trademark musicality straight away. Bandwidth is limited at both extremes – most obviously at the top – but the midband takes you straight to the heart of the matter. Regas have always put the music before the sound and while this might not be to all tastes it's the key to their enduring appeal. The RP1 could have a bit more sparkle and better image focus, but it draws you into the performance with ease, whether it's Tom Waits or Brendel playing Beethoven you can forget the sound and escape into the music. Rega's music-first approach takes a bit of grasping and those coming to vinyl for the first time might find the lack of serious bass and refined highs a little surprising. But give it more time and its tune-playing skills win through. The entry-level cartridge does a decent enough job, but the quality of arm warrants an upgrade in this area and this will give the sound better dynamics and make it less fussy about vinyl – old pressings can show their age as it currently stands. We think the RP1 is a great turntable and one that will force the competition to up its game. This is, of course, excellent news for vinyl lovers and all hi-fi aficionados.